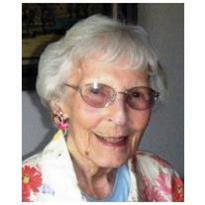 Virginia B. Fuller died at the age of 94 on August 18, 2013. She was preceded in death by her husband Alfred Fuller and her son Terry Fuller. She is survived by her son Guy Fuller and wife Anne, grandson Sam Fuller, granddaughter Claire Riebsomer and husband Chad, and her twin great-grandsons Logan and Devin Riebsomer. Born and raised in Bonham, TX, Virginia attended the University of Texas in Austin with Al and they were married soon after he graduated. During their 70 years of marriage, they lived in Texas, Arizona, Colorado, and New Mexico. She worked as a map maker in the Assessors Office in Colorado Springs and was a docent at the Denver Art Museum. Virginia served as a member of Bienvenidos in Santa Fe. She was an accomplished knitter, enjoyed playing bridge, was interested in antiques & family history, and was an avid Denver Broncos fan. Virginia was always positive and cheerful, and was loved by everyone who knew her, including those who cared for her until her peaceful death at Ponce de Leon retirement home. In lieu of flowers, the family requests that donations be made to the Hospice Center-PMS (505-988-2211). A private family burial will be held.